Witchy Words: [Guest Article: Phaedra] Can Stuffed Animals be Familiars? [Guest Article: Phaedra] Can Stuffed Animals be Familiars? At the beginning of the year, I asked the circle I coordinate, Circle of Fountains, if they'd each like to do a guest article based on a topic that I might not be able to cover. This is a great effort by my amazing circle to give you information that you might not otherwise encounter here at Witchy Words. The following article is written not by me but another member of Circle of Fountains, with credit and notes about its author below. Enjoy! Say the word familiar, and most will think of animals, especially cats. Thanks to popular culture, owls, toads and rats are on the list as well. Merriam-Webster defines a familiar spirit as a spirit or demon that serves or prompts an individual. For any excellent overview of familiars in general, please read this post by my awesome friend, Circle Coordinator and witchy blogger extraordinaire, Marietta: Familiars 101. I have had a couple of animal familiars throughout my life. I love them still and know I can count on them to show up when I call for protectors and guides. For this particular post, I want to talk about a different sort of familiar that I have a lot more personal experience with. A spirit, imp or daemon can, if willing to be a familiar, communicate on its own. However, it can also take residence in an item, such as a stuffed animal. I currently have two stuffed animals that serve as vessels for the familiars that have attached themselves to me. I believe one of them has just transferred vessels as I have grown and even treasured possessions have been lost. The other is a recent addition to my magical life. Please allow me to introduce Bitty Kairy and Galaxy. The imp in Bitty Kairy has been with me for most of my life. She started out in my E.T. stuffie that my parents gave me for my first birthday. She has stayed with me in one way or another, helping me discover my path and generally doing the things daemons do for their people. I didn’t realize until we got home the evening I picked Galaxy out of the bin at Build-a-Bear at my daughter’s birthday why I wanted that particular bear. She quickly made herself known to me and is more of a day to day familiar. I deal with social anxiety and the variety of agoraphobia triggered by crowds. Galaxy goes with me and helps me handle such situations. 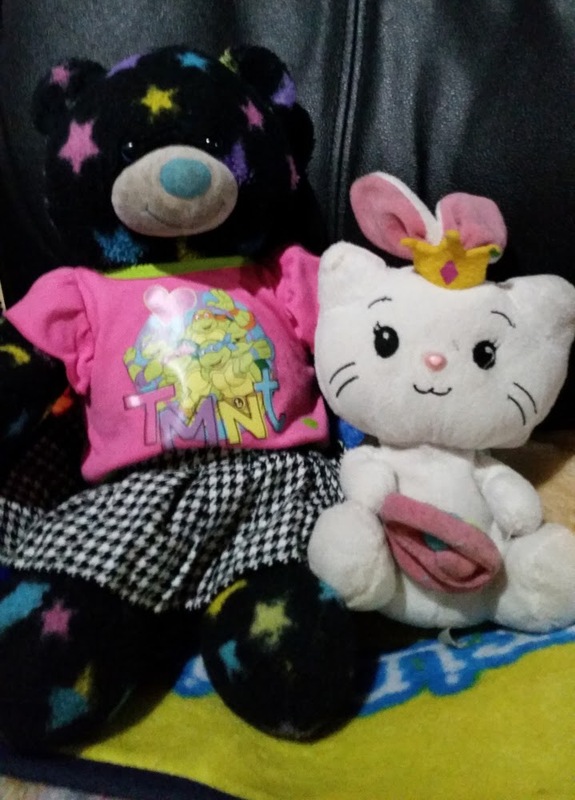 Many of the frequent visitors to Witchy Words have seen both Bitty and Galaxy in pictures. The trio of yellow stuffies that are in some shots are belong to my beloved Laura. She has not yet determined if it is one spirit that uses all three vessels or three separate ones. Their relationship is just beginning. My circle mate Amy also has a familiar spirit in a doll. Here is what she shared with me about her Rosie. Other objects that are likely to be vessels are rings, necklaces, statues or figurines, and heirlooms that can be easily held. If you think you can hear someone talking to you when you hold your grandfather's wedding ring, if you know your lucky necklace does help when you wear it, there is a possibility you have a familiar spirit that is willing to work with you. Keep your mind and inner ear open! The Circle Advocate who reaches out on behalf of Circle of Fountains to other groups and organizations seeking interaction and volunteer opportunities, Phaedra is a wonderful wife and mother of three beautiful children. Transplanted from Texas to Oklahoma, then Oklahoma to Kansas City, she adores ballet and fandoms like Doctor Who and Hello Kitty, but absolutely nothing comes before family. 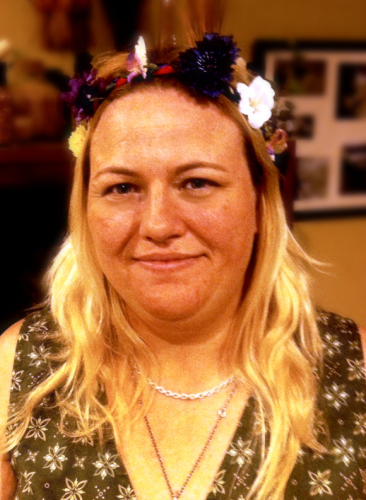 Phaedra describes her craft as green kitchen witchery. Very interesting read! I never really thought about my stuff animals as a familiar, but I guess if we infuse them with so much of ourselves, of course they'll contain our magic and be vessels for spirits if we so allow. I am going to be honest; I still sleep with a stuffed animal every night and I am 28. Bun Bun is an original, stuffed velveteen rabbit I was given my very first Christmas, making him 28 as well. I sleep with him every night, take him on trips, and he is always usually in the room where I perform magic. I have always felt like he was watching over me, protecting me. I can't imagine life without him. Of all the things in my life, living and not, I'd have to say Bun Bun, after reading your post, is probably the closest thing I currently have to a familiar. My cats aren't really interested and the one that was passed away several years ago (she also lived with my parents after I moved out). Thank you for sharing! I'm glad you enjoyed it! My familiars have always been stuffies.